Striking semi-manuscript school-girl map of the Western Hemisphere. An unusual and beautiful semi-manuscript map of the Western Hemisphere dating to 1823. 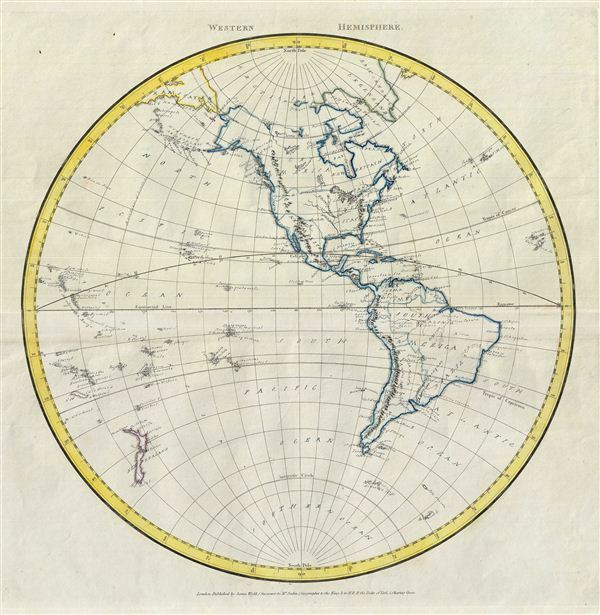 The printed portions of this map follow the cartography of James Wyld and include the basic outlines of the continents, latitude and longitude lines, the equator, the tropics, the Arctic, the Antarctic, and the Meridian of London. The remainder of the map, including all textual labels and color work, had been completed in manuscript, that is to say, hand drawn. Wyld most likely produced this map intentionally without labels for use as a classroom workbook by which children could learn geography by filling in the blanks. The manuscript geographical data and detail throughout is altogether outstanding. The work is completed in a fine hand adept at decorative text and the rendering of rivers and mountains. The geography follows the conventions of the period. In North America, California is identified as part of Mexico. Further north the Oregon-British Columbia border, as might be expected of an englishman, follows the Columbia River, well south of the current border. South America, illustrated in the midst of its wars of independence, features Colombia, Guyana, Brazil, La Plata and Patagonia. Parts of Greenland and Siberia, erroneously labeled 'Kamscatka,' are also mapped. So too are New Zealand and various Polynesian Islands. South of Tierra del Fuego, the 1819 discovery of the South Shetland Islands is noted. Canada appears as New Britain.